PanARMENIAN.Net - Five U.S. Marines went missing after a refuelling plane and a fighter jet collided midair and crashed into the sea off Japan's southwestern coast on Thursday, December 6, Japanese and American officials said, according to Al Jazeera. 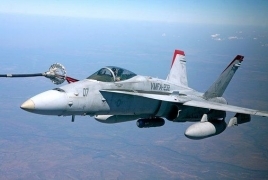 Japan's defence ministry said on Thursday its maritime forces had so far found two of the seven Marines who were on board the aircraft - an F/A-18 Hornet fighter jet and a KC-130 Hercules - at the time of the incident. Defence Minister Takeshi Iwaya said Japan is working with the U.S. to collect and share information about the crash. "The incident is regrettable, but our focus at the moment is on search and rescue," Iwaya said at a news conference. "Japan will respond appropriately once the details of the incident are uncovered." U.S. Ambassador William Hagerty thanked Japan's military for their search-and-rescue efforts and confirmed the incident occurred during a refuelling exercise.